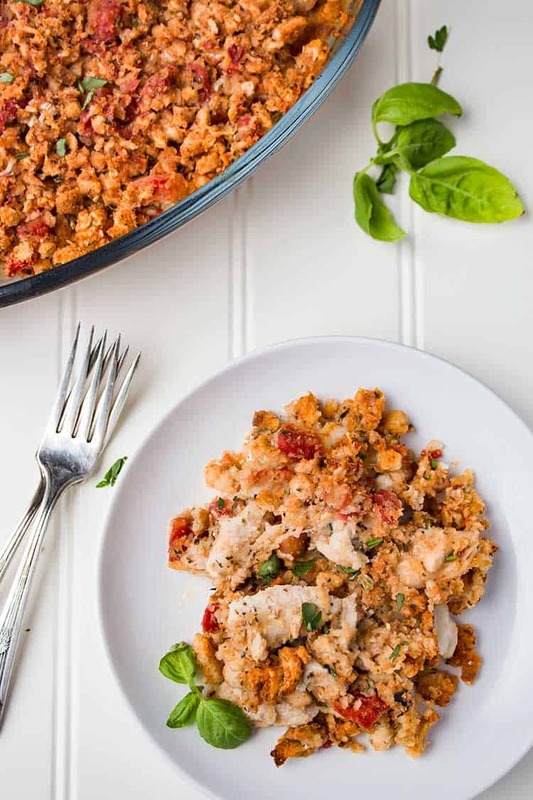 This Bruschetta Chicken Bake is an homage to the great classic Bruschetta Chicken, but in an easy-to-make and easy-to-freeze casserole! There’s a pretty lively debate as to whether you pronounce it like “brush” or like “brusk”, but I promise you there will be no debate on the outcome – it’s just an all-around winner, plain and simple, no matter how you decide to pronounce it! Now I know that everywhere you read online, you’re going to see that you really shouldn’t freeze meals that involve breading or breaded toppings, because they won’t freeze well. But I call phooey on that. I’ve made this one many, many times, and have never had a problem with the stuffing getting soggy or mushy. It freezes just fine, and bakes up great! This little gem of a freezer meal comes from the back of a StoveTop stuffing box. Yup. 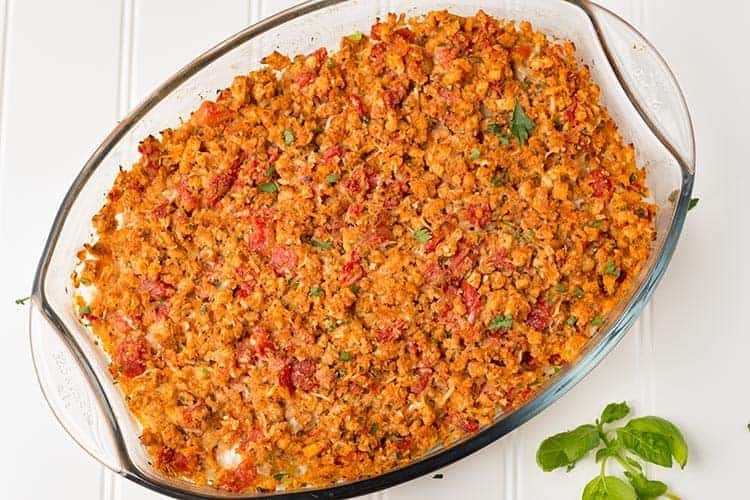 I originally got this recipe from a friend who has used it with her family as a freezer meal. I was making up a bunch of recipes before going in for surgery, and I wanted to add in a few new meals to try. Imagine my surprise when I got out the ingredients to make this meal, and there, on the back of the stuffing box, was the recipe. The very one I was making. Ha! Now, you don’t have to use any particular brand name for your stuffing. Feel free to use generic or store-brand. You basically just want a box of stuffing mix, preferably the chicken variety. If you really feel so inclined, you can go all fancy and make up your own homemade stuffing mix to use with this, and that’s totally okay. But this is one that I generally use for a quick win, so I stick with the boxed stuff – it just makes my life a lot easier on meal-making day. I don’t recommend baking this one right from frozen, as the bread topping can dry out too much and burn. So pull it out the night before you want to use it and let it thaw overnight in the refrigerator before baking. Serve with some garlic bread and a green salad, and you’ve got yourself a quick, easy and delicious comfort meal! 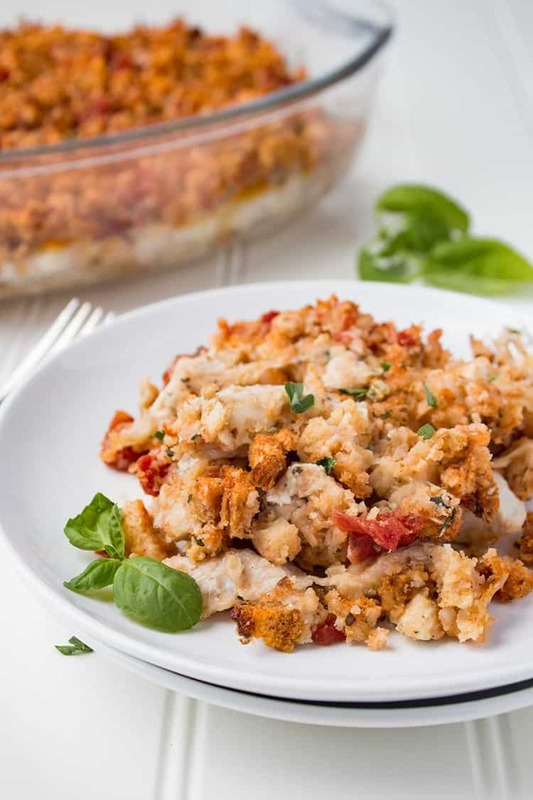 All the great taste of the classic Bruschetta Chicken, but in an easy-to-make and easy-to-freeze casserole! Serve with garlic bread and a green salad for an easy weeknight dinner! Spray inside of baking dish with non-stick cooking spray. Place chicken in bottom of dish and spread evenly. Season with salt and pepper. Sprinkle mozzarella cheese over chicken pieces. 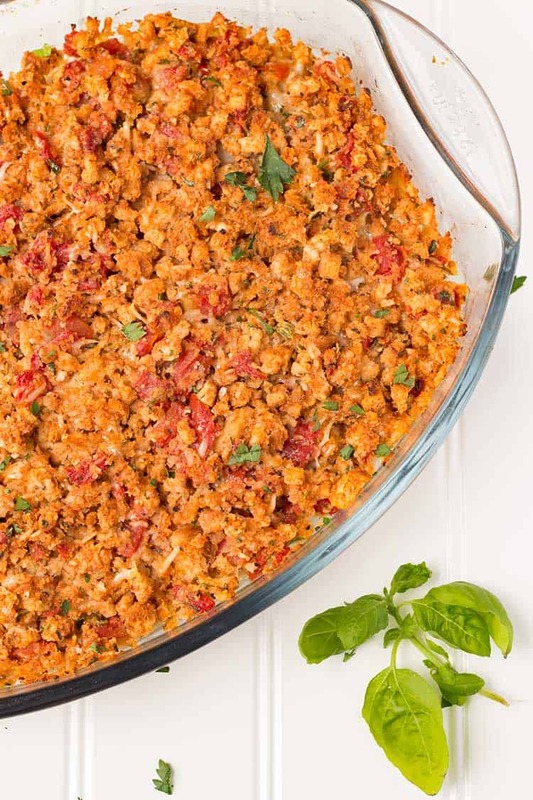 In medium-size bowl, combine stuffing mix, tomatoes, water, garlic and basil. Stir to combine. Spread stuffing mixture evenly over chicken and cheese. Cover, label, date and freeze. Remove from freezer and thaw overnight in refrigerator. Bake uncovered for 30 minutes or until chicken is fully cooked. Do you cook the chicken first? I am assuming no, but want to make sure. No, do not cook the chicken first. Cut it into bite-size chunks, but leave it raw.